Tom Mitchell co-chairs a study from the National Academies of Sciences, Engineering and Medicine (NASEM) showing new kinds of data is needed to assess technology's impact on jobs. “Policymakers are flying blind into what has been called the fourth industrial revolution,” said study co-chairs Tom Mitchell and Erik Brynjolfsson. The study, “Information Technology and the U.S. 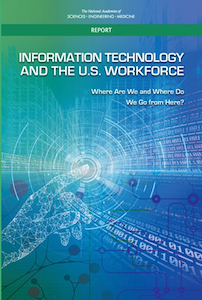 Workforce: Where Are We and Where Do We Go From Here,” was released by NASEM and a related commentary by Mitchell and Brynjolfsson was published today by the journal Nature. Read more about the study report.